Following are four charts that point to an economy and stock market that may be topping. 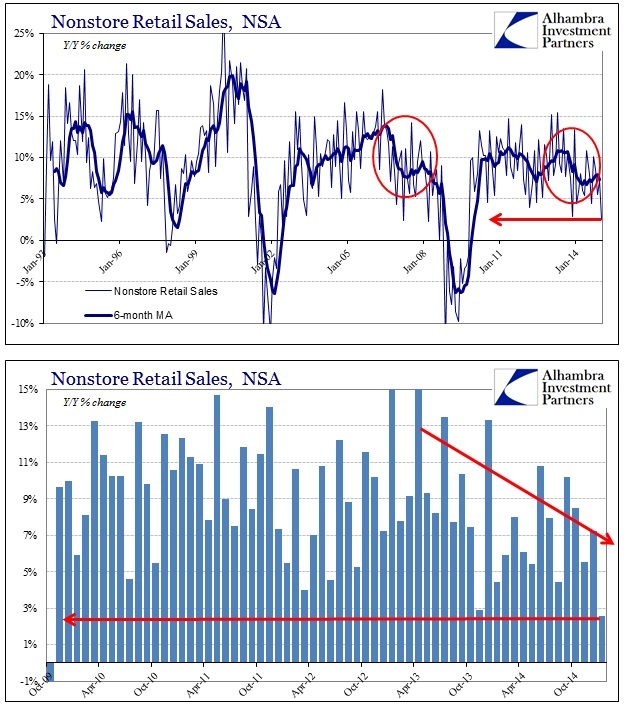 Sales growth reminiscent of last recession…. The stock market at the moment reminds me of those old-time cartoon characters, who would run off a cliff and keep running on thin air—only falling when they eventually noticed there was no ground beneath. In terms of valuations, U.S. stocks are sky high, when measured by methodologies that are actually correlated to future returns. Both this bull market and economic recovery are well past typical lifetimes, and due for a fall, based on history alone. In fact as we move into 2015, there are worrisome signs that an economy many hoped was gaining strength, and would allow stocks to grow into their valuations and find more support, might instead be weakening. We are also experiencing divergences in the stock market and other markets of the type you would expect to find as market participants awaken to the reality that the solid ground they thought was beneath them is not.